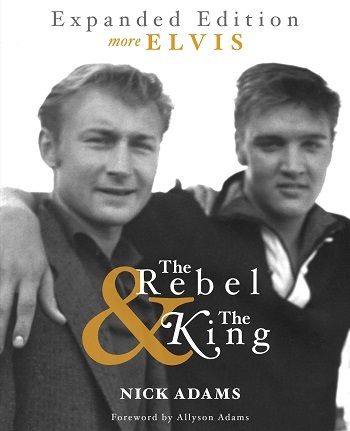 Today we are interviewing Allyson Adams about "The Rebel and the King" by Nick Adams, her father. The book chronicles Nick's relationship with Elvis Presley. I'm a producer, playwright, actress and teacher who believes that the arts can cure anything. Describe “The Rebel and the King” in a few sentences. Nick Adams paints a positive, almost spiritual portrait of his pal Elvis when they both traveled to Memphis for his Tupelo homecoming concert in 1956. Elvis introduces Nick to his family and they share memorable moments with Gladys and Vernon Presley. Nick documents what it was really like being in Elvis' company during the time his life was changing the most. Elvis fans, Nick Adams fans, music fans, Gays, Christians, Hollywood buffs. You discovered the unedited manuscript for “The Rebel and the King” and decided it needed to be published. What made you want to share your father’s story with the world? A lot of negative things have been written about Elvis Presley and Nick Adams because they died so young of drug overdoses. I wanted to highlight their close bond during a fun and exciting time in both of their early careers. The story is a last glimpse of innocence before the end of an era. Elvis was 21 and my Dad was 23. Can you tell us a bit about where Nick Adams and Elvis were in their careers when they first met? Nick Adams was a struggling actor and friends with James Dean and Natalie Wood, because he had just been in the movie Rebel Without a Cause. James Dean had just been killed in a car crash. Elvis' music career was going sky high and he was making his first movie, "Love Me Tender." Elvis was a big James Dean fan and wanted to be a part of that hip young Hollywood crowd, so he became friends with my Dad. Elvis wanted to be a really great actor and my Dad helped him by telling him things James Dean had told him. Did Nick and Elvis hit it off immediately or did their relationship take time to develop? They hit it off the second their eyes met. Elvis reached out his hand and that was all she wrote! They were soul mates in some ways because they both came from very poor backgrounds and had similar mothers. Elvis and Nick both had things to teach each other and the friendship lasted until my father's death in 1968. Did the contents of the book surprise you when you first read it? Or had you already been aware of a lot of the stories? I had no idea the manuscript existed when I pulled it out of my Daddy Box. It was the biggest surprise of my life! I had never read something my father had written and it was about Elvis Presley! I didn't know anything about Elvis or that he was such good friends with my Dad. This whole journey has been incredible. What makes “The Rebel and the King” standout from the other books on Elvis? This manuscript was written in 1956 while it was all happening! My Dad was responsible for revealing some of the first tidbits about Elvis that would shape his legendary image for years to come. Most people that have written about Elvis have done it many years after his death. None of the other books have the immediacy that "The Rebel and the King" has. “The Rebel and the King” also includes a number of photos, some never-before-seen. Can you tell us a bit about these photos? Elvis and Nick are both so handsome and young in the photos! The people over at Elvis Presley Enterprises and Graceland were supportive and gracious to send over a bunch of photos when I contacted them. This new, expanded version even has more pictures because so many people have contacted me since I published the book. How do you think readers will react to this book? They love it! One fan said this was the first book about Elvis that made her smile. Readers say the book takes them back to a time when they were young! So many people have written great reviews on Amazon and I never even asked them to. Is there anything else you'd like potential readers to know about “The Rebel and the King”?